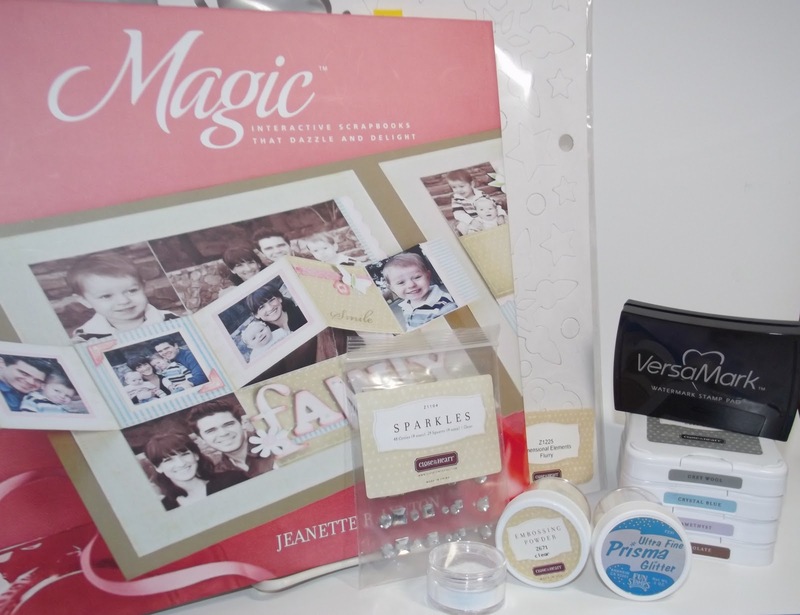 This is my first week participating as a designer on the Heart2Heart Challenges Blog. This week is one of my favorite kinds of challenges....a color challenge....of Crystal Blue, Amethyst and either White or Colonial White. 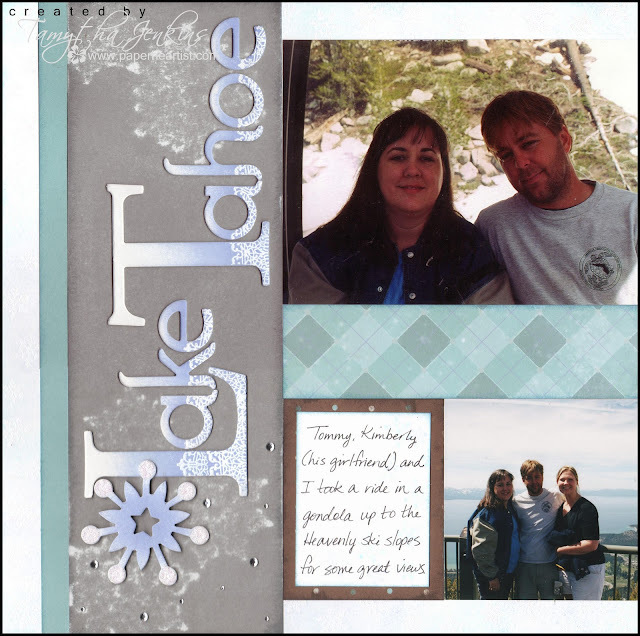 Many years ago, while visiting my mom and stepdad in Northern California, we took a trip to Lake Tahoe. What a gorgeous place! Being from Florida, I found it odd that there was snow in August! August is probably the hottest month here...so I was loving the fact that I got to see snow and even touch it. You know...it's the little things in life that make us happy. :) Anyway, I still had photos from that trip that I had never scrapped. 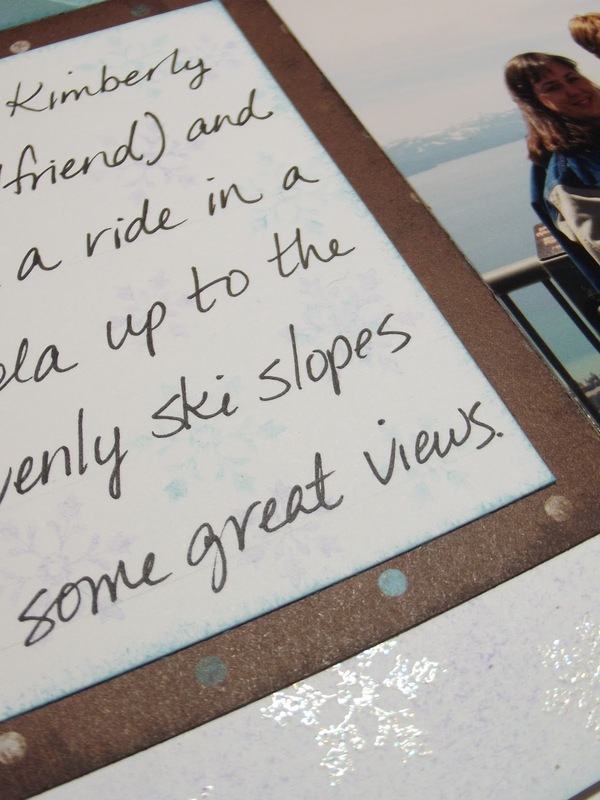 The pictures in my layout below are of my brother, his girlfriend Kimberly and myself taking a ride up a gondola to the Heavenly Ski Resort slopes, just so we could take in the breath-taking views. What fun! This layout is the Levitate design from the Magic How-To Program. 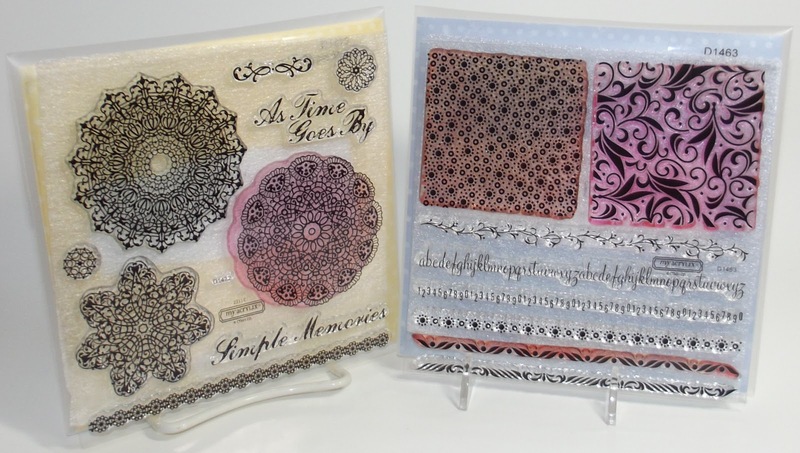 Just a heads-up...the Dimensional Elements Flurry Collection (Snowflakes) will be retiring at the end of this month....so if you like it, you may want to grab it while you can. You can see here on the journaling block where I used Crystal Blue and Amethyst and second generation stamping to create a subtle snowflake pattern. This is my favorite part of the layout. A couple weeks ago, I sanded a piece of paper while it was still on top of my Cricut mat. 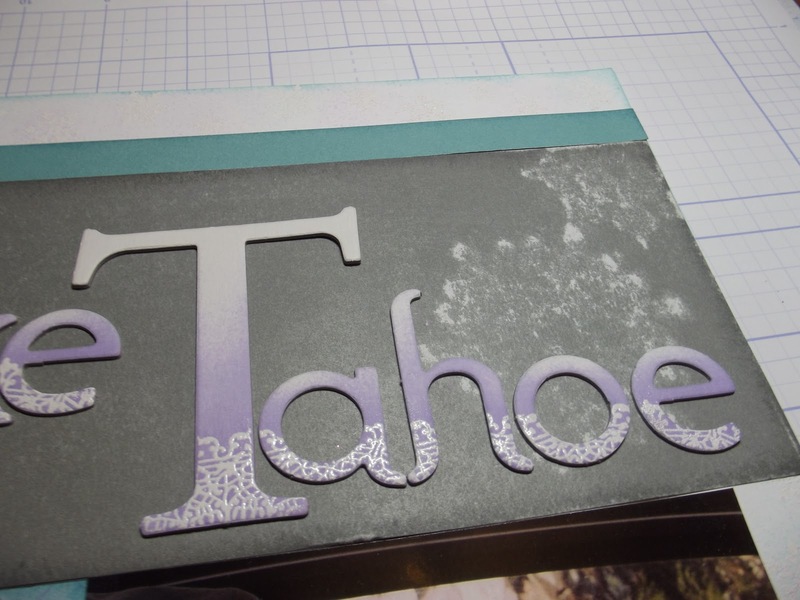 There were some negative pieces still on the mat and it created a kind of ghost pattern on the cardstock. I thought...."Hmmm...I've got to try that on purpose". 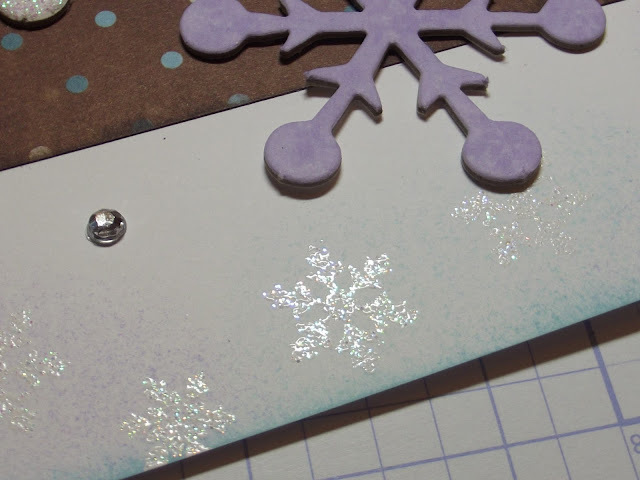 So all I did to get these ghost images of snowflakes was to put a few snowflakes cut from the Art Philosophy Cricut cartridge, under the cardstock and sand. Cool, huh? I sponged the Dimensional Element Snowflake with Amethyst ink, starting from the inside and working out and then applied Stardust Glitz Gel. On the Dimensional Elements Letters, I stamped the bottom portion with a doily stamp in Versamark, then heat embossed with white embossing powder. I then sponged Amethyst ink from the bottom up, with heavier application on the bottom and easing up about two-thirds the way up. Finally, I buffed the embossed portion with a tissue to remove excess ink. I used the same doily stamp on the large snowflake and a background stamp for the snowflake above it, as well as embossing and inking. I applied Stardust Glitz Glitter Gel to the round Dimensional Elements and added a few sparkles. Two things here. One, it's hard to tell from this picture, but after sponging the snowflake with Amethyst ink, I went back and stamped snowflakes on top of it, to create a very subtle pattern. 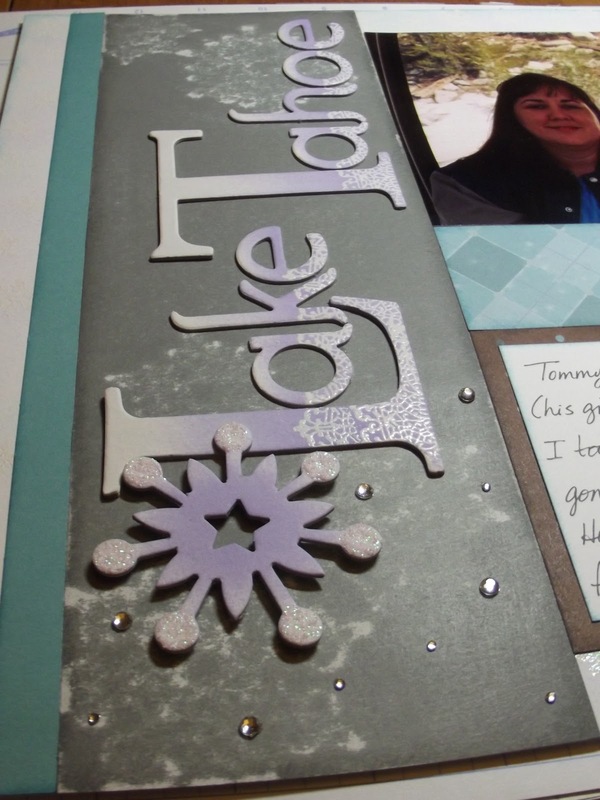 The second thing I wanted to point out...I mixed some white embossing powder and prisma glitter in a small craft jar and embossed snowflakes around the perimeter of both of my background pages. I then went back and inked the edges with Crystal Blue and then lightly touching an inked spong on top of the snowflakes, in both Crystal Blue and Amethyst, and buffed off extra ink. Now...I challenge you to play along. I made a scrapbook page, but you can make a card, 3D item, home decor item...whatever your heart desires. You have until the end of the month to submit your creation...plenty of time, right? Just click on the H2H link to link up your project. It's important to remember the rules of the challenge. 1) Use the colors (or similar, if not CTMH colors) and 2) you must use Close To My Heart products in your project, but it doesn't have to be 100% CTMH. If you don't have Close To My Heart products and would like some, simply contact your Close To My Heart consultant or click here. Wow what a treasure. 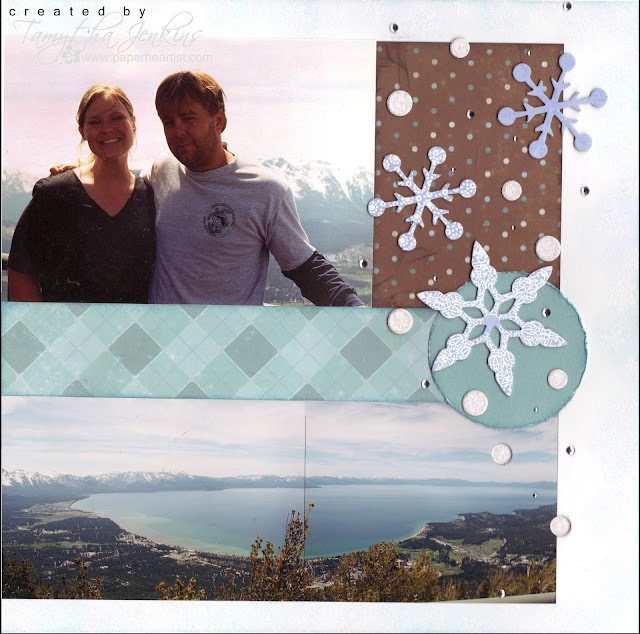 We went to Lake Tahoe in the summer but there was no snow that time. It is a beautiful place. Your pages are absolutely gorgeous. I really like how you did your letters. Very stunning. Thanks for the inspiration. You've inspired me to try this sketch from "Magic!" I love the title letters soooo much! Wonderful layout, your title is DIVINE!!! TFS! 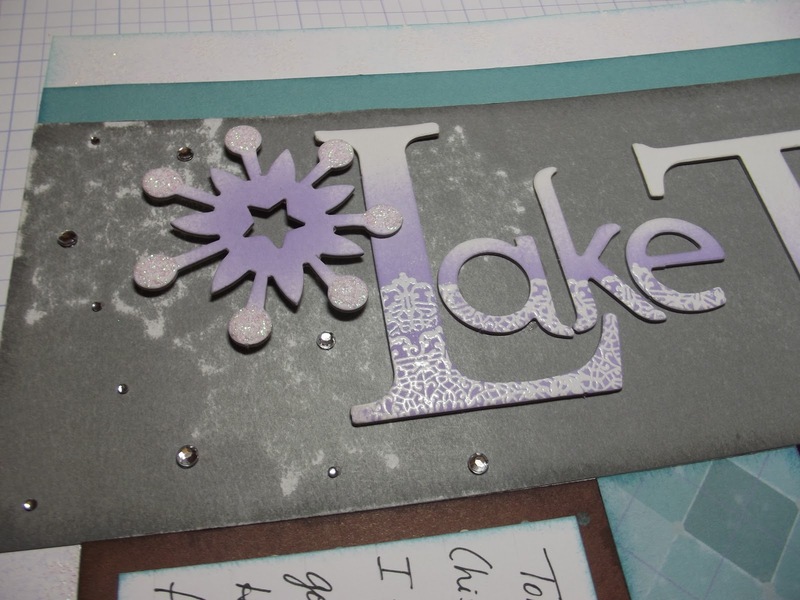 So many beautiful details on this one from the shadow sanded snowflakes to the sponged and glitzed up snowflakes but my favorite is the beautiful lettering with the embossed doily lined up perfectly to make a snowline on your titles! Fabulous! Funny how I love visiting Merritt Island, FL and live a few hours from Lake Tahoe!